NiQuitin Extra Fresh Mint Gum has unique Triple Flavour Technology, with an intense mint burst and layers and layers of freshness. It is used for helping to reduce withdrawal symptoms including the irritability and frustration many feel in the first few weeks of a quit attempt. NiQuitin Extra Fresh Mint Gum is part of a programme designed to support your wish to stop smoking. Using gum at regular intervals gives your body the nicotine you need to help you stop smoking. Stopping smoking straightaway is best for your health. 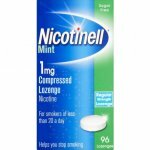 However, if you are not able to, you can also use NiQuitin Extra Fresh Mint Gum to help cut down your smoking, perhaps before stopping, or to help you to stop smoking for short periods of time. 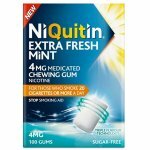 Stopping smoking straightaway (adults and children 12 years and over): Have a piece of NiQuitin Extra Fresh Mint Gum when you have an urge to smoke. Use 8 - 12 pieces of gum (maximum 15) for up to 6 weeks, then gradually phase out their use. Stop using Nicotine Gum when you are using 1 or 2 a day. 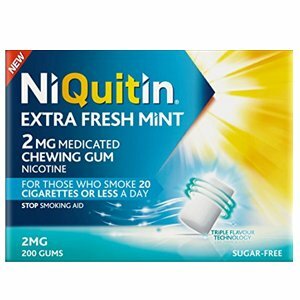 Cutting down, perhaps before quitting completely (adults 18 years and over): Have a piece of NiQuitin Extra Fresh Mint Gum instead of a cigarette when you feel a strong urge to smoke. Cut down your cigarettes by as many as possible. As soon as you feel able, follow the instructions for stopping smoking straightaway above. Stopping smoking for a short periods of time (adults 18 years and over): Have a piece of NiQuitin Extra Fresh Mint Gum instead of a cigarette when you feel a strong urge to smoke. Use a piece of NiQuitin Extra Fresh Mint Gum every 1 - 2 hours. Each piece of gum contains 2mg Nicotine (as Nicotine Resinate). Gum Base contains Butylated Hydroxyl Toluene (E321), Sorbitol (E420), Xylitol (E967), Calcium Carbonate (E170), Sodium Carbonate Anhydrous (E500), Glycerol (E422), Acesulfame Potassium (E950), Sucralose (E995), Talc and Flavours. Coating contains Xylitol (E967), Mannitol (E421), Acacia (E414), Sucralose (E955), Carnauba Wax (E903), Titanium Dioxide, Talc and flavours.